An Alexandria auction house has put an extensive collection of English antiques on the block. Check out some images of what's up for bids online. WASHINGTON — The wedding of Prince Harry and Meghan Markle is over, but a D.C.-area auction house has a new reason for British royal-watchers to get excited. The Potomack Company of Alexandria is auctioning off a collection of items from the Woodland estate of Petersburg, Virginia. The beautiful home — parts of which date to around 1790 — was recently sold, but you can take an online tour here. The auction includes two chairs from the 1937 coronation of King George VI at Westminster Abbey, as well as an invitation to the ceremony. “Attendees could take the chairs home, and so this is a pair of chairs that someone sat in at his coronation,” Wainstein said. Also part of the auction are textiles that hung in Westminster Abbey during the coronations of George VI and Elizabeth II, a plate from Queen Victoria’s dessert service, and a painted wooden panel from one of Queen Victoria’s carriages. 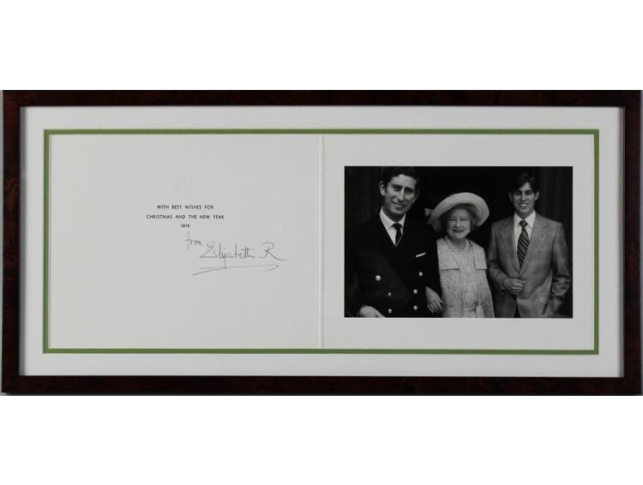 There are also a few items signed by members of the royal family. “We have some Christmas cards [including] one from the Queen Mother to William Tallon … the butler. He was affectionately known as ‘Backstairs Billy,'” Wainstein said. Bidding is underway on these items, which are part of an online auction that ends during the first week of June. The Potomack Company has three other auctions coming up early next month. You can preview the auction items in person at the auction house gallery from Tuesday through June 1.